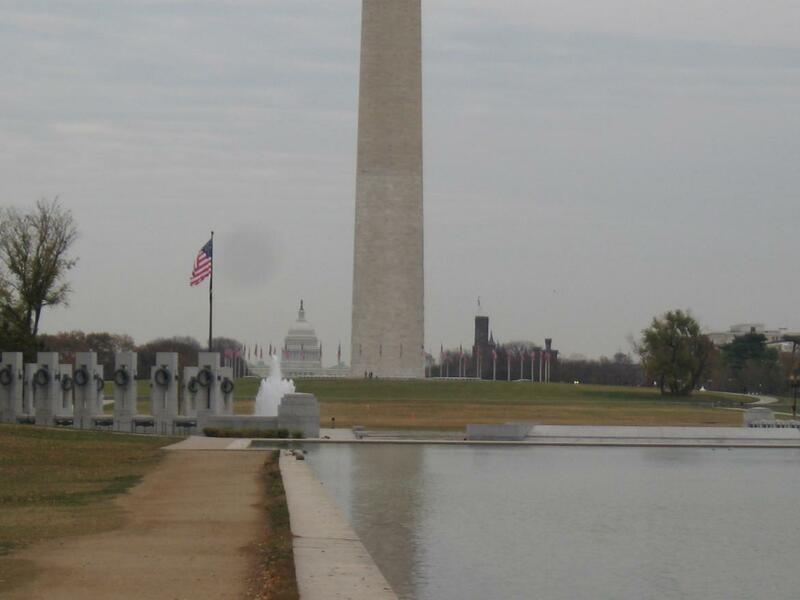 The Washington Monument, today standing 555 feet, 5.5 inches as seen from the World War II Memorial. This view was taken facing east at approximately 7:30 AM on Wednesday, November 12, 2008. 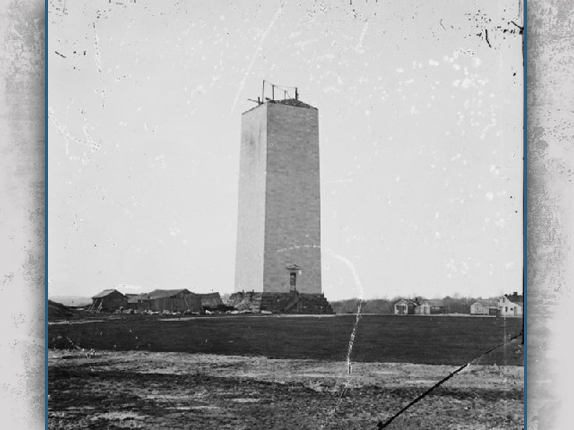 The Washington Monument was constructed in two phases: 1848-1856 and 1876-1884. Lack of money and the Civil War halted construction from 1857-1875. 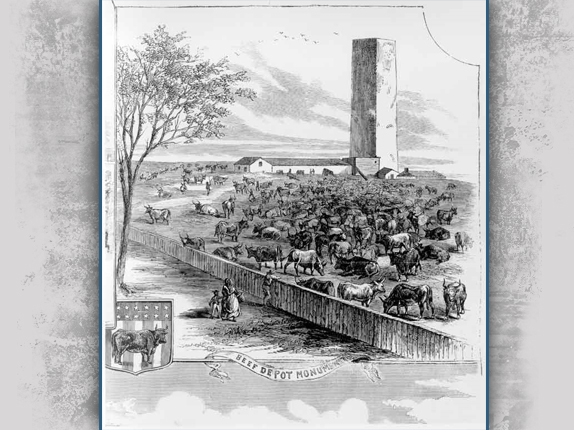 During the Civil War, land around the monument was used as an area to graze cattle, a drill field, and a slaughterhouse. When it wasn’t being used to store meat, the public was allowed to go to the top of the unfinished structure. 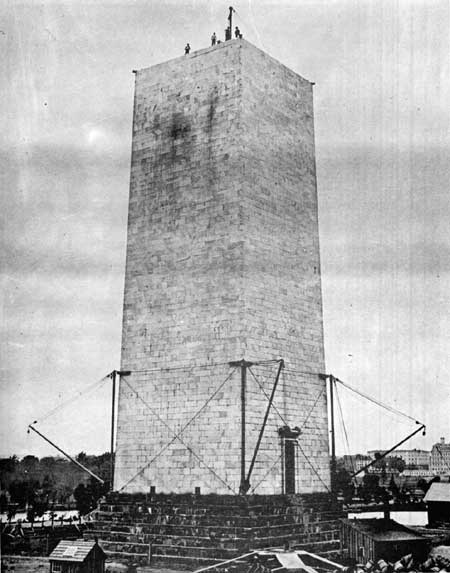 Even at one third of its proposed height the Monument was a tourist attraction because it was the tallest building in America. 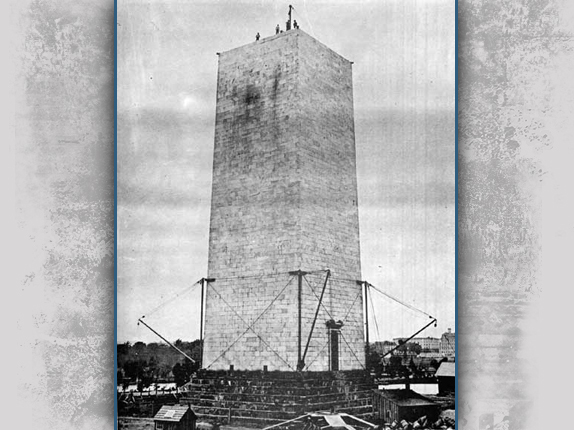 At the time of the Civil War, the monument remained unfinished at approximately 150 feet. Mark Twain stated that the monument “looked like a hollow, over-sized chimney.” Regiments, such as the 62nd New York Infantry Regiment, drilled here in 1861, with their regimental headquarters near the monument. The 62nd New York fought with the Sixth Corps at Gettysburg. This view was taken facing northwest. One may still tell where that 150 feet stoppage point was by the color of the stone. The work from 1848 to 1854 was made of white marble from a quarry in Texas Maryland. In 1879 when work resumed on the monument, four rows were laid with marble from Sheffield Massachusetts. However, problems with delivery of the Sheffield marble forced the cancellation of the contract. 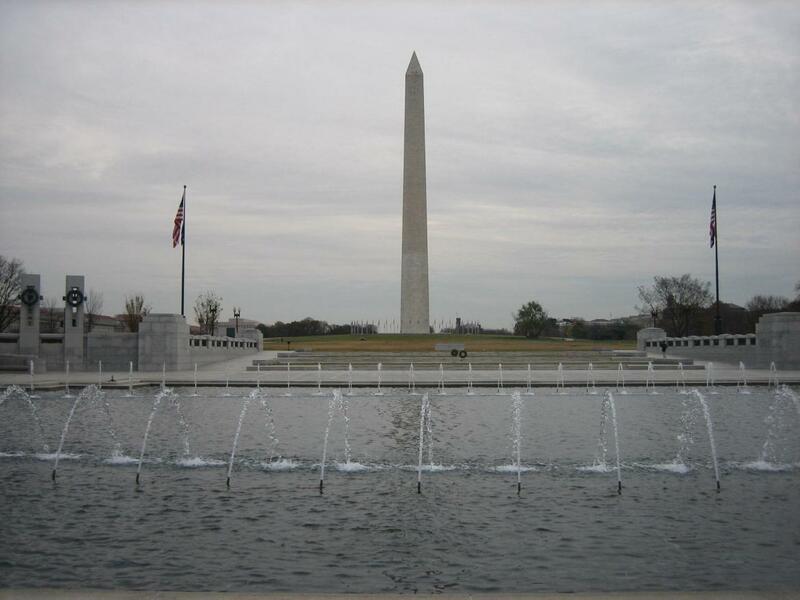 The top of the monument was finished with marble from Cockeysville, Maryland. Photo courtesy of Thomas Clark. This view was taken facing east at approximately 7:30 AM on Wednesday, November 12, 2008. During the Civil War, the unfinished monument was used as a slaughterhouse. When it wasn’t being used to store meat, the public was allowed to go to the top of the unfinished structure. Even at one third of its proposed height it was the tallest building in America and a tourist attraction because of its height. This view was taken northwest. 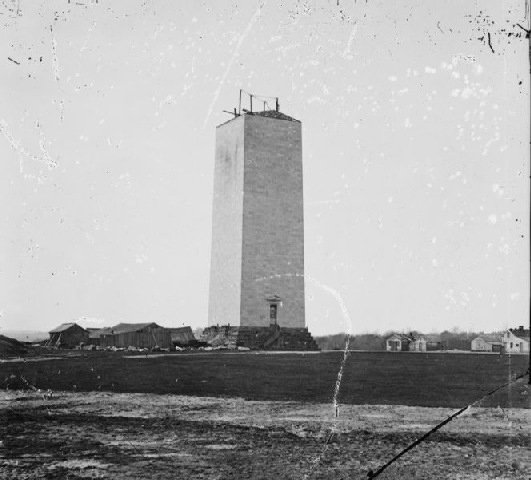 At the time of its completion in 1884, the Washington Monument was the tallest building in the world. The Eiffel Tower surpassed it in height when it was dedicated in 1889 at 986 feet. 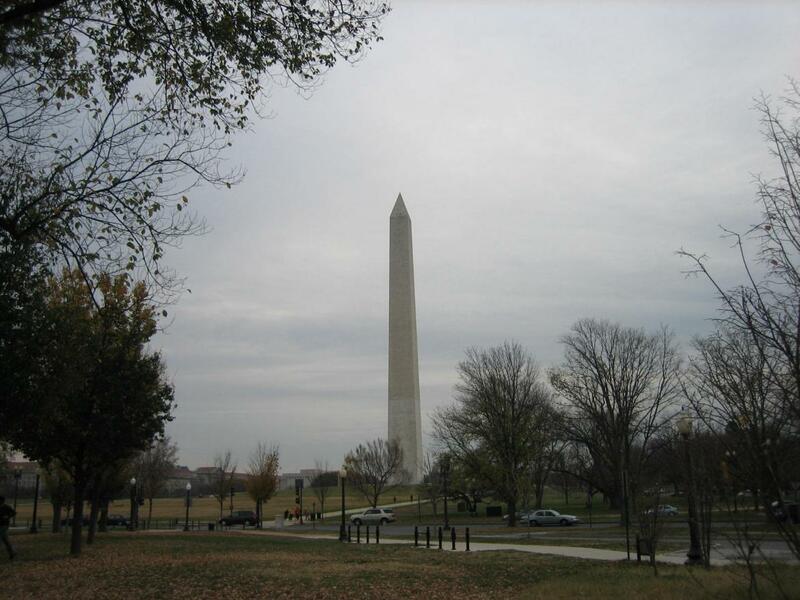 The Washington Monument is the world’s tallest stone structure, and the world’s tallest obelisk. This view was taken facing northeast at approximately 7:30 AM on Wednesday, November 12, 2008. 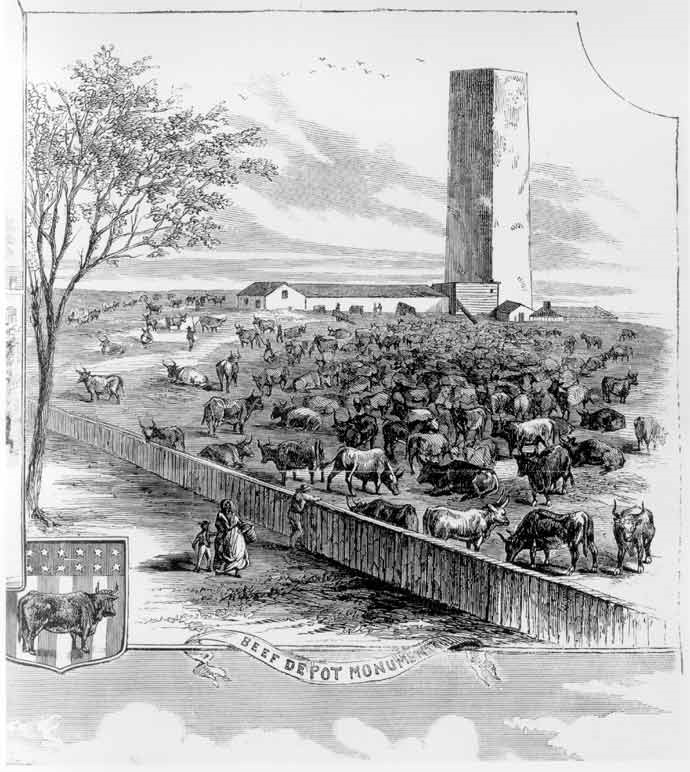 This 1862 drawing from Frank Leslie’s Illustrated Newspaper shows the cattle grazing around the Washington Monument, and labeled this area a “Beef Depot.” This view was drawn facing northwest in 1862.